You can tell by my hip use of jargon (e.g. "Bull") that I've got a freshly minted business degree of some sort and am preparing to create a publicly traded company that will eventually tailspin itself into a nugatory enterprise. Yes, nugatory. Until then, we can all count on one thing: more sushi in Austin. Case in point: a recent memo from the owners of swanky Piranha Sushi indicating that they are moving full throttle on their new 207 San Jacinto location. They even have a help-wanted Craigslist ad (screen capture). Estimated opening: end of Summer, 2009. 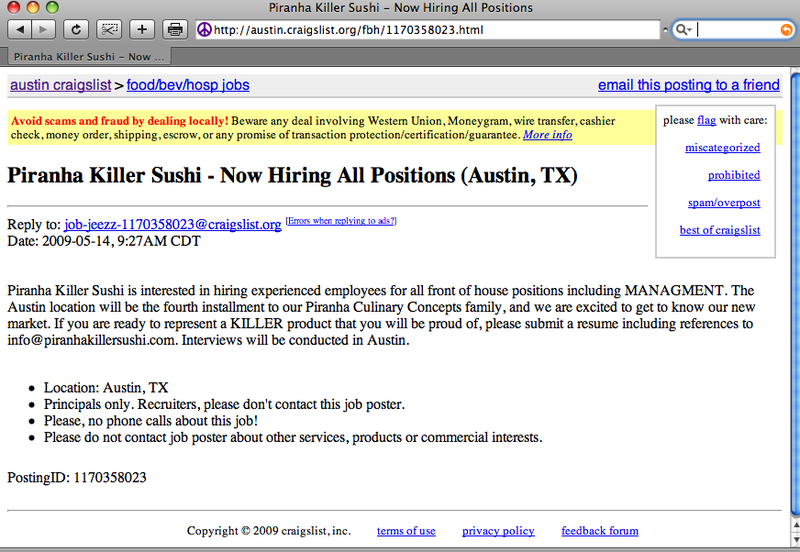 There are also details now on the prophesized North Austin Uchi location. It will be named Uchiko and will reside in the old Seton Medical building at 4200 N. Lamar which will be remodeled by Michael Hsu. Estimated opening: Spring, 2010. Austin is selling sushi at both the top and bottom ends of the price spectrum, but the pricey sushi bars are clearly being fueled by the wave of immigrants that came to Austin in the past 3-4 years (especially last year when census reports show that Austin was the #1 or #2 fastest-growing metro area in the country, depending on how you slice the stats). By immigrants, of course, I mean Californians who have sold their over-priced real estate and are now sitting on too much extra cash.